The legacy of architect Julian Francis Abele was brought into focus in the mid-1980s when in the midst of a student protest at Duke University in Durham, North Carolina, his great grandniece reminded the campus community that her long unsung ancestor was responsible for the eleven original architectural drawings for the campus. Born in Philadelphia, Pennsylvania on April 21, 1881, Abele was the youngest of eight children born to Charles and Mary Adelaide Jones Abele. Throgh his mother he was a descendant of Rev. Absalom Jones, the founder of the Free African Society and St. Thomas Episcopal Church in Philadelphia. Young Abele was educated at the Institute for Colored Youth and the Brown Prep School. He entered the Pennsylvania Museum and School of Industrial Arts at age sixteen and, as the school’s highest ranking student and only black, graduated with a certificate in architectural design in 1898. He excelled in his studies at the University of Pennsylvania where he was elected president of the University of Pennsylvania Architectural Society and graduated with a degree in architecture in 1902. While at Penn he won the Arthur Spayde Brooks Memorial Prize and the T-Square Club Prize. He also served on the student yearbook committee and a president of the Architectural Society. Abele’s accomplishments came while he worked all four years as a designer with the Louis Hickman Architectural Firm in Philadelphia, juggling his afternoon job with evening classes at the University. After graduation he was hired by the Philadelphia architectural firm of Horace Trumbauer in 1902, The firm helped finance three years of study at l’Ecole des Beaux Arts in Paris, France. Abele returned to the United States in 1905 and rose quickly in the firm becoming the second highest paid employee. Abele set about designing mansions and country homes for the wealthy elite in New York, Newport, Rhode Island, and Philadelphia. His public buildings included the Philadelphia Free Library, the Philadelphia Museum of Art, and Widener Memorial Library on the Harvard Univeristy campus in Cambridge, Massachusetts, churches, mausoleums, banks, stores, school buildings, hotels, and apartments. He also designed three of the buildings on the Duke University campus: the Duke University Chapel completed in 1932, the Cameron Indoor Stadium completed in 1940 which would eventually become one of the most revered athletic venues in the world, and the Allen Administrative Building completed in 1954 after his death. In all, Abele designed or helped design over 400 buildings in his career. Late in his career (1942) he was elected to the American Institute of Architects. Abele was not only a master architect. He worked with wood, ceramics, iron, copper, brass, precious metals, stained glass and water colers. He produced furniture, jewelry, paintings, and lithographs as gifts for friends and associates. In 1925 Abele married his piano teacher, Marguerite Bulle, a native of Paris who was twenty years his junior. The couple had three children, Julian Jr., Marguerite Marie, and Nadia Boulanger, named after renowned Paris composer, conductor, and pianist Nadia Boulanger. When Marguerite left her husband for another man, Abele raised the children as a single parent. Abele, an unassuming fair-skinned black man who lived in a white world, was careful to avoid situations that potentially could cause him embarrassment or humiliation because of his race. 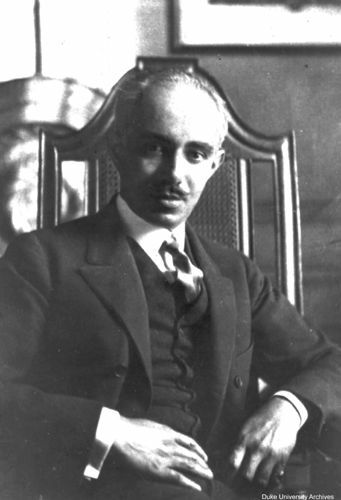 While his employer, Mr. Trumbauer, who dropped out of school as a teenager, brought in the clients, Abele worked quietly in the background as the most successful black architect of his era. Abele died of a heart attack in his hometown of Philadelphia on April 18, 1950, three days before his 69th birthday. Dreck Spurlock Wilson, ed., African American Architects: A Biographical Dictionary 1865-1945 (New York: Routledge, 2004); https://www.philadelphiabuildings.org/pab/app/ar_display.cfm/21458; http://search.library.duke.edu/search?id=DUKE005758002.